Rabies is a killer disease! 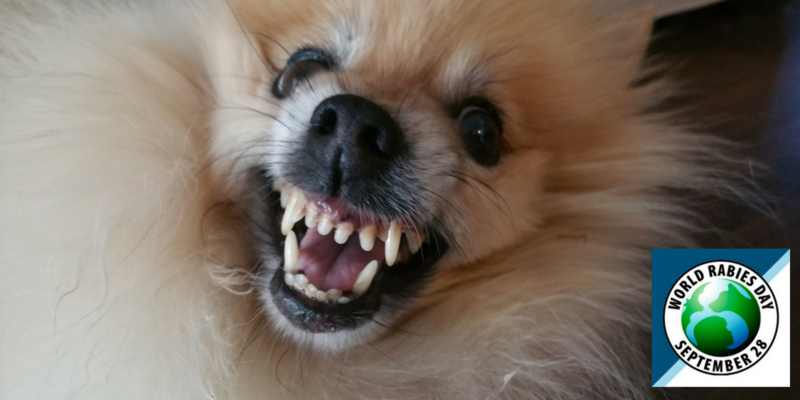 According to the World Organisation for Animal Health 60,000 people still die each year from Rabies and almost all human cases derive from dog bites. The death rates in developed countries where the disease hasn’t been eradicated is very low due to ready access to treatment and widespread information. Unfortunately, in developing countries this is not always the case. People may not have access to medical professionals nearby and there is little information on how to act if an animal bites you. Some people in endemic countries have no knowledge that Rabies is deadly, others are unaware that immediate care of animal bites is required in order to be able to treat the disease. Rabies has a near 100% death rate once the first symptoms occur and 40% of all human Rabies deaths are children. Humankind has all the means to eradicate this ancient but still deadly disease by 2030 and vaccinating the animal population is the key. Countries with the lowest canine vaccination rates have the highest human infection rates. 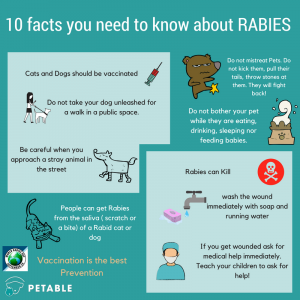 The risk of an outbreak is such a big public health concern that most travel requirements for pets, even from and to countries where Rabies is not endemic, must include documentation of Rabies immunization (vaccination with a lab-confirmed protective level of antibodies). In developing countries, wildlife isn’t the main reservoir for the Rabies virus, dogs are! If it were possible to achieve vaccination rates of 70% in Asia and Africa’s canine population, herd immunity would benefit both canine and human populations making the eradication of the disease possible. The inhumane mass killings of canine population in developing countries that is still commonly seen as preventive action against Rabies not only doesn’t help to control the disease, but in some cases worsens it (because the virus present in the corpses may be found and ingested by wildlife or other dogs). Vaccination is key. Petable is promoting awareness to this problem throughout the globe and on World Rabies Day will send out a global Push Notification to all Petable’s users mobile phones reminding people that vaccinating our pets against Rabies is seemingly very simple but a very relevant thing in the global view of making sure we rid the globe of Rabies once and for all. Be Petable, Protect your pets!